Keep it fresh all night, keep it fresh all day. 1. Prevent brown sugar clumps by tossing a marshmallow or two in the container. You'll never have to toss a hardened rock of brown sugar again, and you won't have to spend money on a special brown-sugar-keeper disc. Read more about it here, and get more food storage tips here. 2. 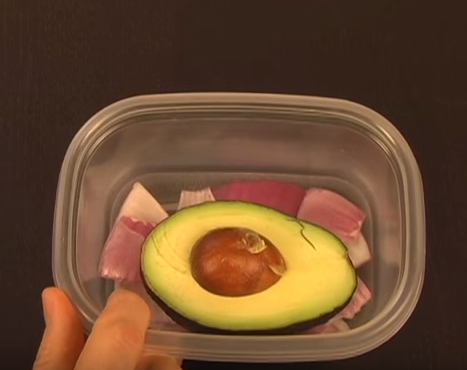 Keep the halves of avocado fresh by storing them in an airtight container on a bed of roughly chopped onions. I know, sounds crazy, right? But watch the video and be amazed. 3. 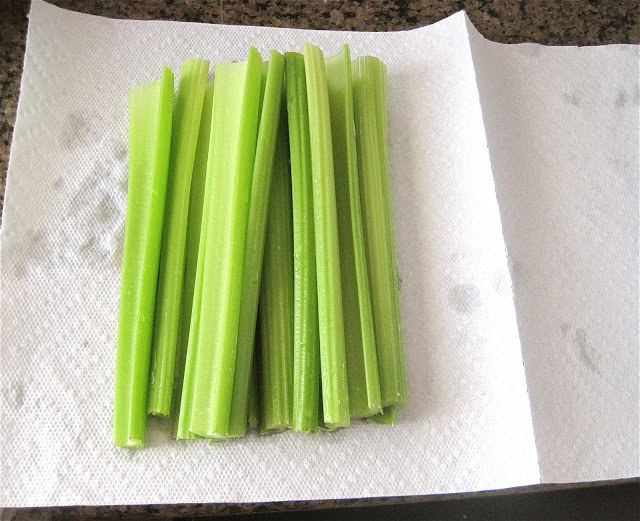 Cut the leaves and roots off of celery, wrap it in a paper towel, then wrap that in foil. In the tutorial, the blogger says this helps it stay fresh for up to three weeks. 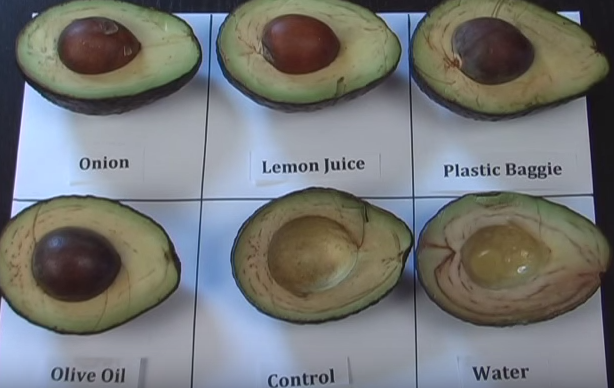 Of course, you have to keep it in the fridge crisper drawer, too. 4. Get rid of any mold spores lurking on your berries or greens by rinsing them well in vinegar water before putting them in your fridge. This actually works — it's something I do when I know it will be a while before I'll get to eating all my fruit. Here's exactly how to do it. 5. After you're done washing your produce, put it in a plastic bag or glass container with a folded-over paper towel inside. 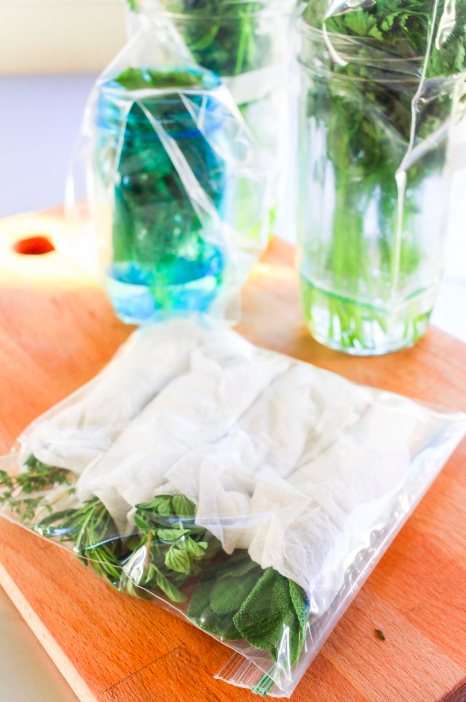 The towel will soak up any extra water or condensation that may occur after washing, and help keep the veggies fresh. Read how here. 6. Wrap onions individually in (clean, unworn) pantyhose, then store them in a cool, dry place. To get an onion when you need one, you simply nip open the knot at the bottom of the hose, and slip the onion out. They can keep for months at a time this way! Here's the tutorial. 7. Cut half an inch off the bottom of your asparagus, then store it in water in the fridge. Also, cover the tops with plastic (the plastic produce bag from the grocery store works). Learn exactly what to do here, and get 21 delicious asparagus recipes here. 8. Make a batch of smoothies, then freeze them in mason jars so they last at least three weeks. Yeah I know it sounds weird, and no, the mason jar glass doesn't shatter as long as you only fill it up to the freezer fill line (which most glass jars will have near the top). Here's how to make it. 9. If after cooking you have way too many extra green onions, chop them up and freeze them in an empty water bottle (plastic OR glass). Then they're quick to pull out whenever you need to add some to a stew. Here's the tutorial. 10. Flip your all-natural nut butters upside down to keep them from separating. Read more about how and why it works here. Keep the lids screwed on tight, and don't try and do this with a lid that doesn't screw onto the jar. 11. Freeze tablespoons of tomato paste so you never waste the second half of a can of tomato paste again. You freeze them on the baking sheets, then after they're frozen, you put them in a plastic bag for long-term storage. Read about how to do it here. 12. Then freeze any extra fresh herbs in olive oil, so they're easy to drop into stews, pastas, and scrambled eggs. 13. 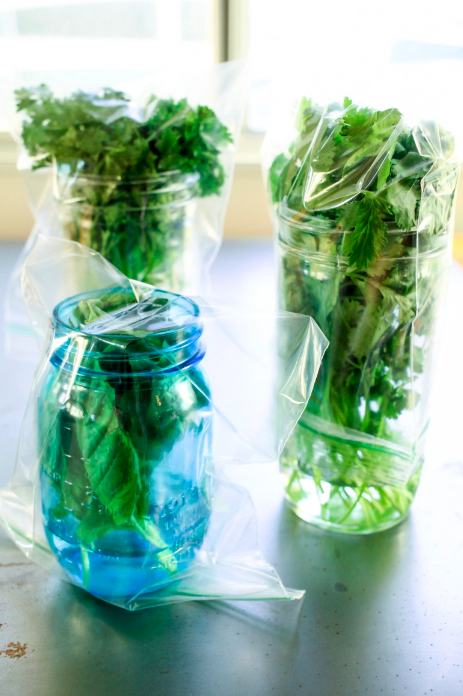 Or go ahead and store them in moist paper towels or in jars with water. The way you store them depends on what kind of herbs they are — read all about it here. 14. When you're not using it, store your butter in the back of your fridge, not in the butter spot in the front door of your fridge. You want your butter to stay cool and dark, and this is the coolest, darkest place. Read more here. 15. Separate your bananas and wrap each stem in a small amount of plastic wrap to help them last longer. It can really work — read about why here, and get more tips on how to store groceries long-term here. 16. Whether you used half a carton of chicken broth for dinner or got fancy and made your own, store the leftovers by freezing them. 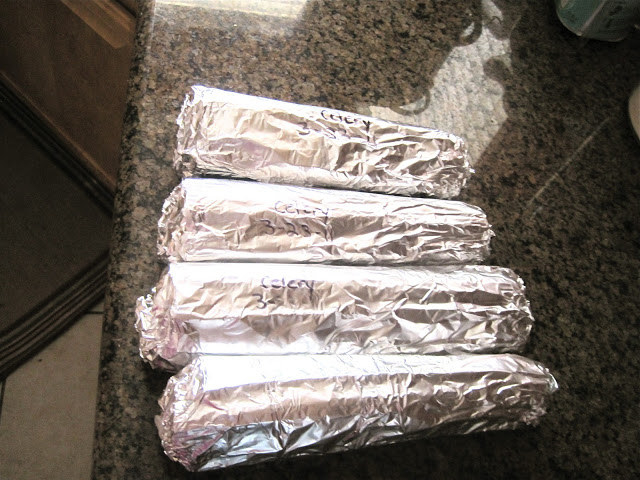 Basically the freezer is the gold standard of making food last. Read more about why this technique is helpful here. 17. Make extra soup, then ladle it into red Solo cups to freeze. Grab one or two cups' worth to defrost anytime you need a quick dinner. Um, brilliant. Get the how-to (plus a recipe for this creamy chicken and gnocchi soup) here. 18. Store a cut loaf of bread in a paper bag, cut-side down. Read more about it here — this is the best way to store it so that the crust doesn't get soft, although it will also stale faster than it would if you kept it in a plastic bag. 19. Pour your paper bag of flour into an airtight glass jar. It'll help keep the bugs out. Read more about it here. I personally use these jars. 20. Stash leftover pizza slices in a plastic bag to keep them from drying out in the fridge. Then when you decide to reheat them (which, PS, you should do on the stove), it will be almost as tasty as it was fresh. Read more here. 21. Store your milk in the coldest part of the fridge — the back of the middle shelf. Storing it in the door may be convenient, but the most temperature fluctuation occurs in the refrigerator door. So to help your milk be its best and freshest self, you have to keep it out of the door. From here. 22. Make a double portion of cookie dough to use the next time guests come over, divide the layers with wax paper, then freeze them. 23. Do the same thing with a sliced chocolate cake for the evenings. Now relax and enjoy all that fresh food AND all the money you saved by not tossing stuff you never got to eat!